I love Scalloped Potatoes and again these are cooked in a cast iron skillet, and would be super paired with the meatloaf recipe I shared earlier. Both of the potatoes & meatloaf would be great cooked in cast iron skillets on the fire pit while camping! Heat a 9 inch skillet over medium heat. Add the butter and reduce heat to low. Once the butter melts, add in the flour and whisk for 30 seconds. Add in the garlic, thyme, a pinch of salt and pepper, and whisk in the milk until smooth. Remove the skillet from the heat and pour the milk mixture into a separate bowl. Arrange the sliced potatoes in the skillet in an overlapping spiral pattern. Season each layer with a bit of salt and pepper, and sprinkle cheese between every layer of the potatoes. 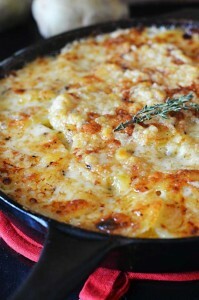 Pour the milk mixture back over the potatoes and then cover the top layer of potatoes with the remaining cheese. Cover with foil and bake for 1 hour. Remove the foil and bake for 5-10 minutes until top is golden. Let cool for 5-10 minutes and then serve! Earlier I shared with you how to care for and maintain your cast iron. Today I thought that I would share some wonderful recipes using cast iron. Preheat oven to 350 degrees F. Spray a 10-inch cast iron skillet with a non stick cooking spray; set aside. In a large bowl, combine all the above ingredients, except for the water and ketchup, and mix together until well blended. Be careful not to handle the meat mixture to much. 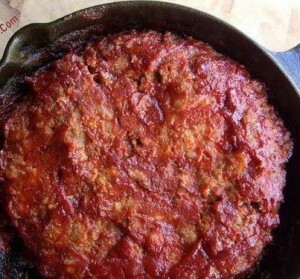 Shape into a round bun and place in the cast iron skillet. Pour water half way up in the skillet. Bake in the oven for 1 hour or until meatloaf is done. Spoon ketchup over the meatloaf and return to the oven for another 15 minutes.